DekTec's industry-standard MPEG-2 transport-stream analyzer. The StreamXpert provides detailed statistics on PIDs, services and tables in real time. It analyzes and decodes audio, video and system information. Note: If you own a StreamXpert v1 license, then StreamXpert 2.0 is a chargeable upgrade, unless you have bought the v1 license in Sept 2014 or later. 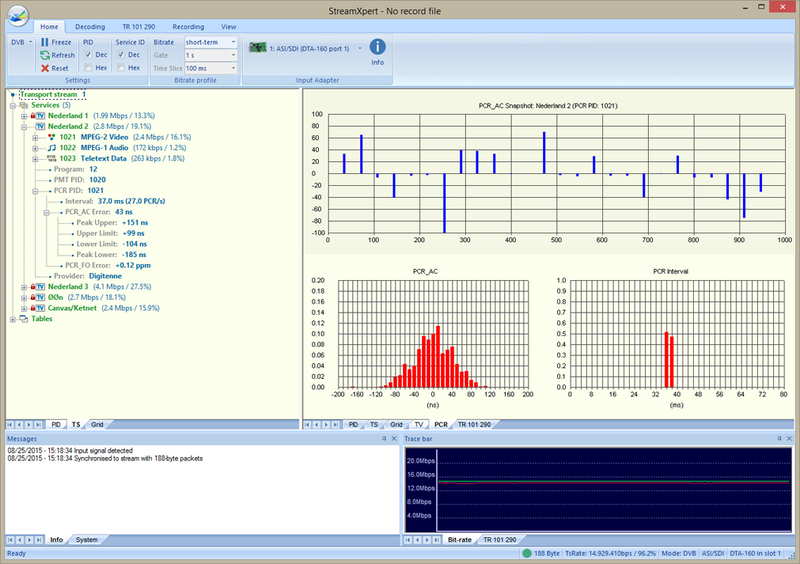 StreamXpert 2.4 - Transport-stream analyzer for use with any DekTec input adapter. Includes one year of software maintenance, in which you can install new versions. 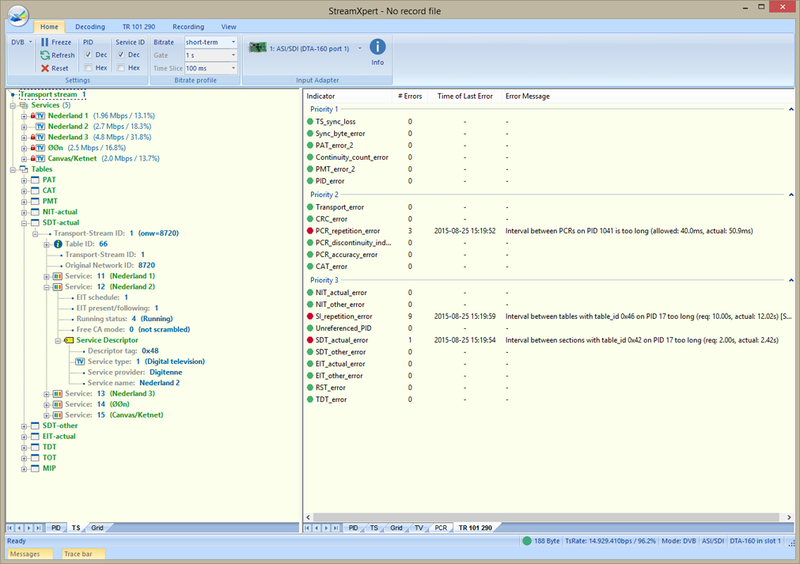 After the maintenance period you can continue to use StreamXpert, but not install new versions. 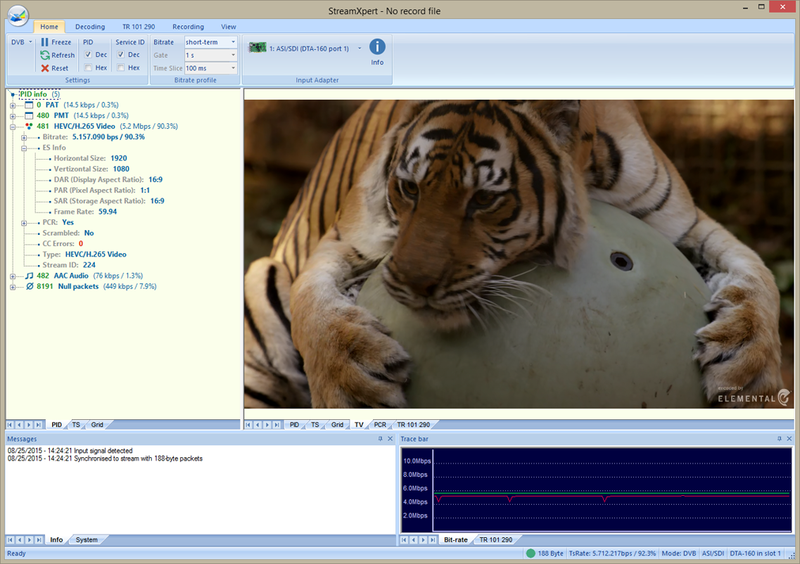 StreamXpert Lite - Light-weight version of StreamXpert for viewing and recording transport-stream contents, and for decoding audio and video. StreamXpert v1 to v2 upgrade. StreamXpert 2.4 license on a USB dongle for transport stream analysis of IP streams on a local NIC. StreamXpert 2.4 license on a USB dongle (not bound to a DekTec device) for use with any DekTec input adapter or for local NIC. One year maintenance for StreamXpert. Two years maintenance for StreamXpert. Three years maintenance for StreamXpert. Quality monitoring of transport streams in studios, head ends, etc. Lite (-SL) – Lower-priced version with decoding and basic recording functions only. The Full version is an essential tool for all digital-TV professionals that need a fully featured stream analyzer. The Lite version serves as a basic transport-stream viewer and recorder. Upgrading from StreamXpert Lite to the full StreamXpert 2.4 is easy. Just contact your local distributor or DekTec for a quote for DTC-320-SX StreamXpert 2.4. Application software for real-time analysis of SD- and HD-SDI signals. SdEye is a waveform analyzer for SD- and HD-SDI signals, while the StreamXpert is a transport-stream analyser. Application software for 24/7 transport-stream monitoring. Xpect allows simultaneously monitoring of multiple transport streams and allows integration with 3rd party monitoring systems for 24/7 network supervisions. While StreamXpert is a standalone application for real-time and in-depth analysis of a single transport stream. Application software for playback of MPEG-2 compliant transport streams and SDI recorded files. StreamXpress is able to playback MPEG-2 transport streams that are recorded by the StreamXpert.